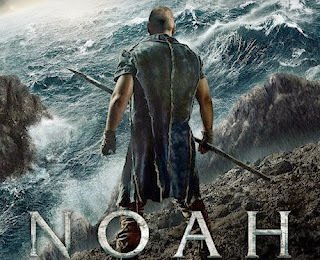 When I saw Darren Aronofsky's "Noah" last night (its opening night), I had no intention of writing a review on it. I consider most films based on the Bible as either silly or bad, even the "critically acclaimed" ones, and the little I knew about this movie going in, told me it will likely be a mess, cause I knew it was drawing on apocryphal sources and a comic book ("illustrated novel"), but I'm always open minded to give things a chance before I make a decision on it. On the plus side, it was made by Darren Aronofsky, who has made some of my favorite films in recent years, and whom I've been a fan of since 1998. This being the case, I expected at least a great film with a possibly bad script. The film was compelling and exciting visually, unlike most Bible movies, especially these days. That's about all the positive things I can say about this movie. Beyond the visuals, this movie was a disaster of biblical proportions. I understand you sometimes have to go "off script" from the original source material to form a compelling movie, but this movie is pretty much an entire re-telling and re-imagining of the biblical Noah, and it leaves out all the parts of the original story that make the story sensible, and it replaces it with silly drama that in the end made absolutely no sense. And may I add, the theology of the film was "flooded" with stupidity. In the beginning was darkness. God created the universe from nothing with a Big Bang explosion, and through a process of evolution the seas and the earth teamed with life, until man and woman finally came on the scene. In Paradise they are tempted by a serpent to eat of the forbidden fruit, and original sin enters human nature. This leads to Cain killing his brother Abel, then Cain is cursed by God and establishes cities on earth that become habitations of sin and evil. The descendents of Cain are in constant enmity with the descendants of Seth, Adam and Eve's other son from whom came Noah ten generations later. On the second day of Creation fallen rebellious angels named Watchers are cast out of heaven and fall to the earth becoming stone-like creatures capable of being destroyed by humans, and redeemed if they repent. These cursed Watchers protect and help build the cities of Cain until the sons of Cain decide to start killing them. Now the Watchers hate mankind and want to return to their "Creator" (this is the only name used for God in the entire movie). When one of them hears Noah has been called by the Creator through dreams to build an ark, he rallies the Watchers to get behind Noah and they end up doing most of the brunt work in building the ark that will help save a portion of creation from the destruction by flood. Noah is called by the Creator (through nightmares and hallucinogenic drugs) not because he was "just and perfect", as the Bible says, but because he is a pretty good guy that is not part of the cursed descendents of Cain. In the deserted land they are in, the Creator suddenly creates a forest, and these trees will be used to build the ark. Then the animals start coming, and as they settle in the ark they are drugged into hibernation until the flood recedes. It is while building the ark that Ham, the middle child of Noah, realizes that his father will not find a wife for him and his younger brother Japheth, while the oldest son Shem has a girlfriend/wife who is apparently barren, but after a miracle of grandpa Methuselah she suddenly has the ability to bear children and immediately takes advantage of this opportunity. Ham begins to resent his father for making this decision, which is based on the fact that the daughters of men are too sinful, so he runs to the habitation of the sons of Cain to learn to eat meat and kill, which is something Noah doesn't do. But when he is there he finds a helpless girl that he decides to make his wife. As it begins to rain, Ham and his new girlfriend/wife go back to the ark, but the descendents of Cain rush to the ark by instigation of their leader, and Ham's girlfriend/wife gets caught in a bear trap, and as Noah rushes to help his son, he realizes he has no time to help Ham rescue her so they leave her to get trampled by the mob. As the rain comes pouring down, the Watchers and Noah kill all the people trying to get on the ark as the family of Noah gets settled in. The Watchers start getting killed, and they fly back into heaven. Everyone outside the ark dies, except the leader of the mob who has somehow snuck into the ark as a stowaway. In the ark you have Noah and his wife, Shem and his apparently barren wife, Ham and Japheth with no wives. The message being conveyed is that God intends to kill the entire human race because they all bear original sin, but is using Noah to make sure the innocent animals remain alive. As the wife of Shem realizes she is pregnant, Ham is being tempted to rebel against his father by the stowaway. Noah makes it clear to his family that they will all die childless, and the human race will be extinct, and he will do anything to ensure this, because it is the will of the Creator. When he finds out about the pregnancy, he informs them he will kill the child if it is a girl. This is when the downward spiral of Noah begins, and it becomes him against his family. Noah's wife helps Shem's family prepare to leave the ark by a small boat to escape the wrath of Noah, meanwhile Ham is trying to kill his father together with the stowaway. Ham decides to save his father and kills the stowaway instead of his father, but Noah goes on to destroy the escape boat and rushes to kill the newborn. When he sees that twins have been born, apparently twin girls for each of the other sons to copulate with, his intention is to kill them, but they are too cute so he lets them live. He realizes that he cannot do what the Creator wants him to do, so Noah falls into depression. They land on a beach and Noah settles off by himself in a cave and gets drunk because he is depressed for not fulfilling his mission. Lying naked on the ground, Ham sees him and doesn't help him out of resentment for not saving his girlfriend/wife, but Shem and Japheth cover him without looking. Ham decides to leave his pathetic father and journey off alone into the sunset, where he will eventually die childless. Noah reconciles with his wife and it is assumed that Japheth will populate the human race with his two nieces, even though there is no indication this is exactly what the Creator had in mind. The End. Basically there was a lot of unnecessary drama in the movie that became so silly that for the last hour of the movie I was in a constant cringe. As I tried to find parts of the movie I could redeem, for which there may be a few at times, it just descended from bad to worse. Though I would not recommend this movie to someone trying to learn about Noah or seeking to be inspired or even for a good old fashioned morality tale, I am not one to tell anyone not to see a movie. As dumb as it is, some people may like parts of it. Those interested in seeing the movie for the sake of seeing a visual masterpiece, I would say see it and make your own decision on the rest. If one wants to put a positive spin on it as a modern day midrash, then I would caution to view it as no more that an imaginative midrash of the authors of the script with really no theological value.